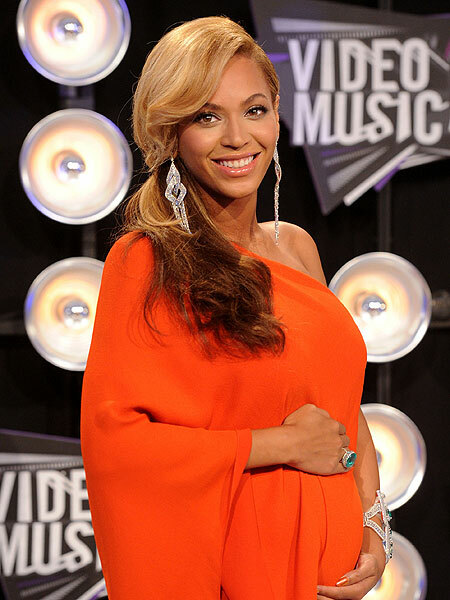 It looks like singer Beyoncé Knowles and husband Jay Z are expecting their first child! After three years of marriage to rapper Jay Z, it was pretty apparent Beyoncé was expecting their first child. The singer stepped onto the red carpet in a stunning flowy red gown, dripping with jewels and holding onto her stomach as she posed for the cameras and smiled big. The "Crazy in Love" singer took to the stage wearing a purple tuxedo jacket saying, "Now everybody asks me why I'm smiling from ear-to-ear." She then unbuttoned her jacket, rubbed her stomach and said, "Tonight I want you to stand up on your feet; I want you to feel the love that's growing inside of me." Later, she performed a stunning number to her song "Love on Top" -- and ended it rubbing her belly. Check it out! Beyoncé, who married music mogul Jay-Z in 2008, will turn 30 on September 4.